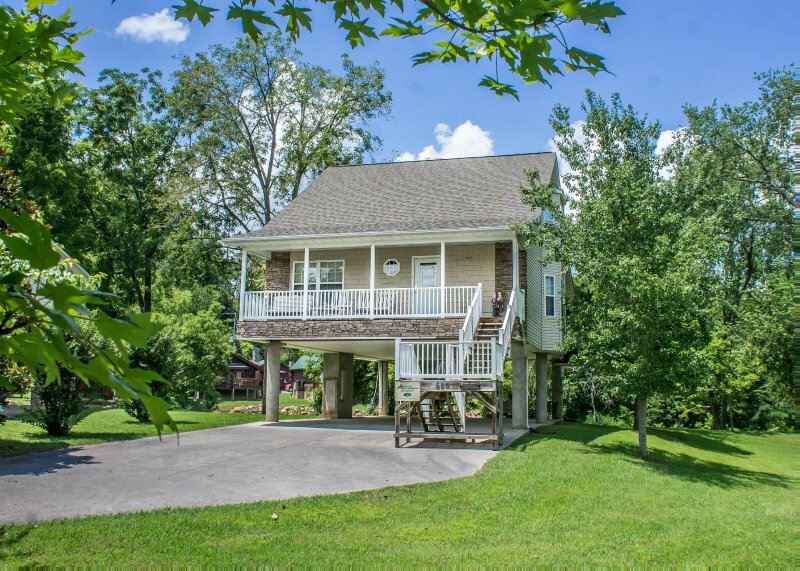 Pigeon River Chalet is located in the Riverpoint community and is also just a hop, skip and a jump to the Dollywood Theme Park or the Cal Ripken ball fields. At the Pigeon River Chalet you will find covered parking big enough for a boat on a trailer and there is a porch swing that faces the river. The covered front porch has a glider bench and is a great place to watch the sunrise coming up over the Smoky Mountains with a cup of coffee in hand. As you enter Pigeon River Chalet you will be amazed by its spacious rooms and elegant décor. The kitchen has plenty of space and everything you will need to prepare the family meals. The dining, area with its river view, makes for the perfect place to enjoy breakfast, lunch or dinner. The dining room table will seat four with three bar stool...Pigeon River Chalet is located in the Riverpoint community and is also just a hop, skip and a jump to the Dollywood Theme Park or the Cal Ripken ball fields. At the Pigeon River Chalet you will find covered parking big enough for a boat on a trailer and there is a porch swing that faces the river. 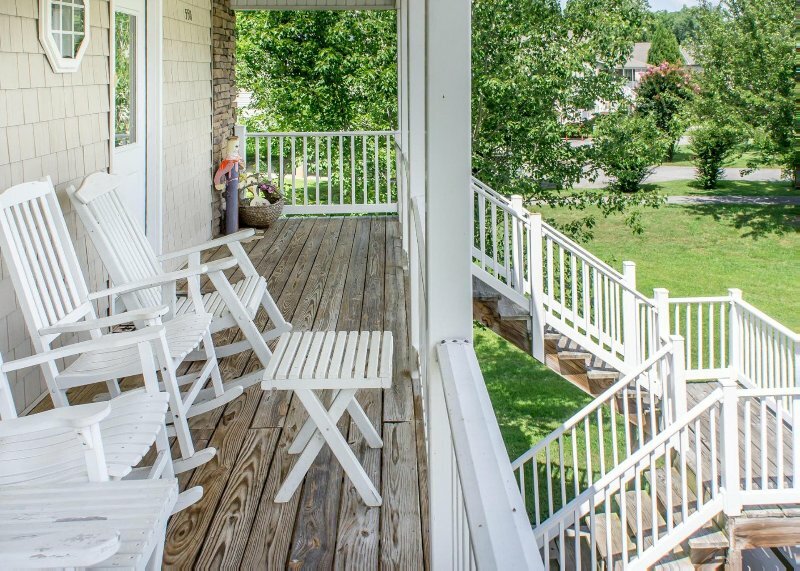 The covered front porch has a glider bench and is a great place to watch the sunrise coming up over the Smoky Mountains with a cup of coffee in hand. A cozy and comfortable living room awaits you with large windows so you have a great view of the Pigeon River and the leather sofa and love seat in front of the gas fireplace which is set in stacked stone and only adds to the elegance of the Pigeon River Chalet. Break out the popcorn and enjoy your favorite DVD or VHS movie with the whole family on the TV with cable. 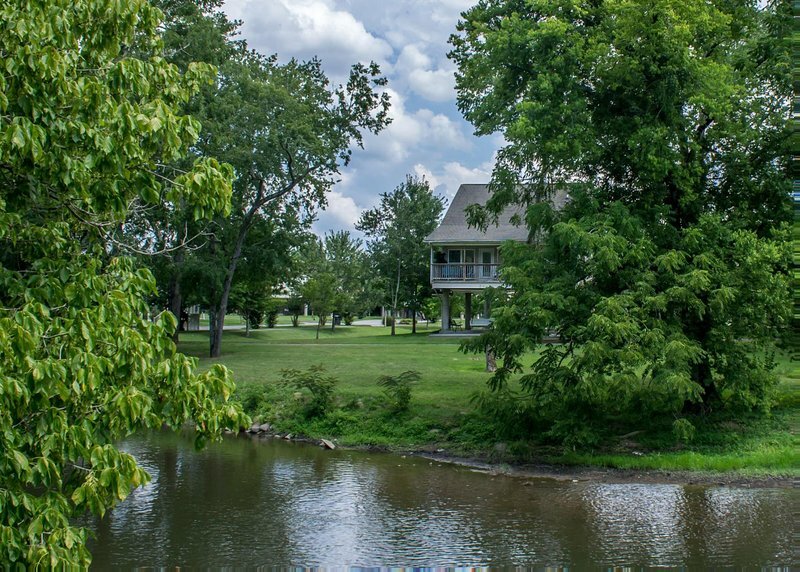 Or step out onto the large covered deck sitting on the river and relax in the soothing hot tub or sit in a rocking chair and just enjoy the scenic surroundings and the sound of the rippling waters from the river flowing right by you. There is a charcoal grill on the porch for additional cooking.